One of the must-do’s of travelers in Thailand, aside from touring the temples and shopping their hearts out, is to take a Thai cooking class. After all, where else can you be guaranteed an authentic Thai cooking experience than in Thailand? 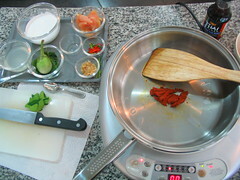 There are plenty of cooking classes available in Thailand, not just in Bangkok. Some specialize in vegetarian fares, while some even gives you a tour of the Thai markets, so you’d know how to pick the freshest ingredients. I picked Thai Kitchen. I picked this particular class because I am a sucker for good looking websites. Shallowness aside, I liked that they don’t have the market tour (for I hate going to the wet market), and it’s fairly easy to get to (just a short walk from the Saladaeng BTS station). The recipes differ each day, so you can choose which day you’d want to attend, depending on your own schedule and food preference. I opted to attend the Friday class, as I wanted to learn how to cook pad thai. They had a promo then, and instead of paying THB2,000 for the class, I only had to pay THB1,000. The instructor was very professional and encourages us to ask questions. He started the class by introducing us to the common herbs and ingredients used in Thai cuisine like galangal palm sugar and kaffir lime leaves. It was a pretty good value, I think. First of, there were only 5 of us in the class, and we each have our own work space with the necessary cooking equipment. Due to the time constraint, some of the items in the menu were prepared by the instructor, like the lemongrass tea and the sticky rice with mango, while the shrimp and pork toast were prepared by the students and deep fried by his assistant (as there was only 1 deep fryer). 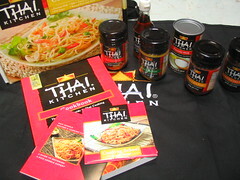 After the class, we get to eat the dishes we cooked, and they even gave us a goody bag which included a Thai Kitchen apron, Thai Kitchen cook book, and samples of their products like the fish sauce, coconut milk, red, yellow and green curry pastes. 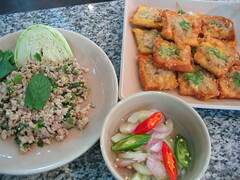 If you’re headed to Bangkok, set aside a morning and some moolah for a Thai cooking class. It’d definitely worth it! How fun! I would have really enjoyed that, and wish I had time for a class while I was there. I’m looking to do this in Bali when I go next month, have you heard of any places there that offer cooking courses? The only one I know of is open only on M – W – F,, and Ill be there Sat-Mon lang. I haven’t looked into Bali yet, so I really can’t recommend any. The food sure looks yummy! Agh, I’m so envious. I wish I could cook like that. I would like know how can you the special offer THB 1,000 only for the lesson. Because I didn’t see the offer on the website.